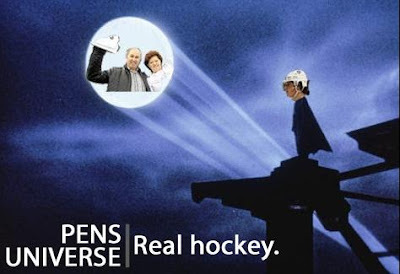 Another late night night for us Pens fans and after the first period you started to contemplate about going to bed. 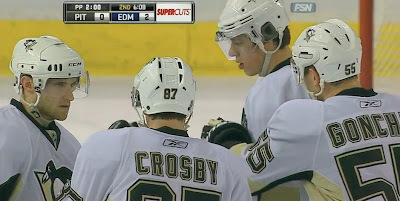 The Pens only had 3 shots and the Oilers 4. The second period rolls around and you expected the Pens to be at least up a goal when the Oilers have a goaltender between the pipes who's GAA is 4.11 with a save percentage of .855. 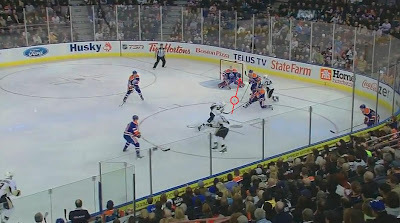 A questionable call on Craig Adams, at the end of the first, enabled the Oilers to start on the PP at the beginning of the second and to make matters worse, it was a 5 on 3, Geno was in the box as well. 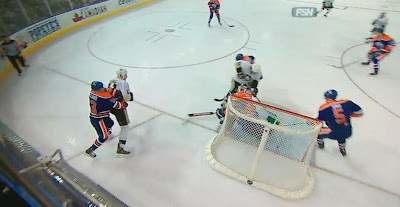 The Oilers capitalize on the 5 on 3 and go up 1-0 after Fleury initially robs Cogliano with a ridiculous toe save but with a little luck Cogliano dishes in the rebound. Mike Rupp goes to the box and the Oilers go back on the PP. A nice one timer from Visnovsky ends up behind the Flower. 2-0. 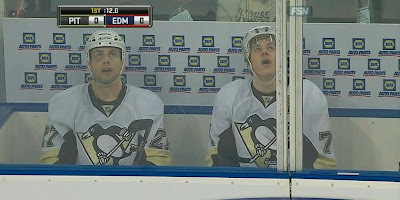 The Pens haven't let up 2 PPG in a game in a while. At this point you begin to pray to the Hockey Gods that it will be Comeback City in the third. Oh did they listen. The Sesame Street Line goes on a rage and TK gets the Pens on the board first. Tyler Kennedy now has 3 consecutive games with a goal. And the Pens take the heat right out of a hot kitchen. The Oilers couldn't rebound because they were completely stunned. That's what thinking a 2 goal lead on the defending Stanley Cup champions is good enough to win will do to you. Sesame Street Line: FTW, literally. Jordan Staal, Tyler Kennedy and Matt Cooke were an unreal group of humans last night. Staalsy set up all 3 goals, and TK and Cookie cashed in the first 2. They are the best damn 3rd line in the NHL hands down. Geno: was flying around the ice, it was like he was a mad man. But the poor guy can't buy himself a dang goal. Don't worry guys the sleeping Giant will WAKE up.